Keep your outdoor belongings neat and tidy without sacrificing your outdoor aesthetic with this attractive PATIOROMA Wicker Storage Box. 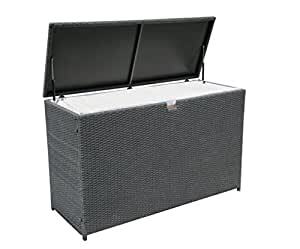 This generously sized box opens on a strong hinged lid that stays open as you access your stored items, useful for stashing away anything from chair cushions to pool toys. A sturdy aluminum frame resists rust and prevents sagging, allowing you to enjoy this piece through many years of outdoor entertaining, while the weather-resistant hand-woven PE wicker will complement a wide variety of outdoor decor with its natural brown hue. A protective inner liner ensures that your belongings will remain secure and free from damage.